Welcome to the CryptoTheorem Documentation. Whether you are new to CryptoTheorem or mastered it already, you can find useful information about the platform ranging from introductions to advanced features. This howto is about CryptoTheorem News reader service. Our services process millions of news and social media mentions regarding to the cryptocurrencies world including RSS, Twitter, Reddit, Telegram, Trollbox, Stocktwits and major financial news outlets including crypto circuits. In this howto we are going to give a walkthrough of the major functions and use cases of this service in order to explore new trading opportunities. In the case if you are looking for real-time news it is the best service. CryptoTheorem NLP processing automatically highlights assets, events, time and date, organizations, exchanges, persons. Our News Reader displays every news item with colorized and designated notation which signifies the presence of common dictionary words that might determine sentiment of a text. CryptoTheorem uses multiple technologies in order to generate sentiment indexes which might be based on keywords, statistical and NLP modeling and deep-learning models. We have to emphasize it here that news sentiment indications are informatory, they might not contribute to our overall sentiment indices and event detection. Different methods exist to measure the sentiment of an event or a news, these models might have different properties and might not be accurately aligned with the underleying meaning of a series of events. Different sentiment measurement methodologies might be applied such as polarity based methods, Eckman emotional cube, and so on. You can always access news archive by searching on our site. Search brings results from our own search engine timestamped with accurate timestamps in order to avoid lookahead bias. You can always find the search bar on the top of any page. The search function have predictive entry capabiltiy to save you time. CryptoTheorem analyses and collects wast amount of news data and scores their sentiments and event chains over a long period of time. By visualizing it we offer discovery of potential trading opportunities based on events and entities in the news. Whenever one is using the Search function, this chart is displayed automatically on the top right on the screen. This feature can also be brought in front by selecting pieces of text. By selecting text, the chart will be displayed with data from the recent months. Our interactive chart is displaying the absolute hits of volume of mentions in our data feeds and absolute highlights for positive and negative events. This view helps discovering significant events, and might help to better characterize the followup wave of events. The top side of the chart is showing absolute mentions of the selected term. The bottom side of the chart is showing absolute mentions of positive and negative keywords in relation to the selected keyword. By clicking on one of the bars on either chart, brings and additional filter into the text view and filters the news to the particularly selected date, or on which bar on has clicked on. This feature is helpful for pinpointing events and do a drilldown like analysis. Due to the large volume of news influx (also that might be a reason also for using our service), we show you a short snapshot of the recent news we encountered with, which is no older than 1 hour. You might see 3 months backwards with our default chart configurations. This howto is about CryptoTheorem Sentiment Dashboard. Our service process millions of events and mentions every day in the cryptocurrency and financial, geopolitical news space including social media mentions and business wire services including crypto news circuits. On Sentiment Dashboard one can oversee the current social sentiment over major topics such as major cryptocurrencies, altcoins, ICOs, Wallet software, Cryptocurrency exchanges and many more from the mainstream financial and geopolitical news. Sentiment Dashboard allows to compare general sentiment over major assets, organizations and topics and quickly followup with the recent trend in the sentiment of those topics. For professional users we offer possibility to create custom topic dashboards and create custom sentiment index. Sentiment cards are displayed on the Sentiment Dashboard are easy to interpret. We assign a value between -100 and +100 as Sentiment Index. This is an unfiltered 24 hours sentiment index of the given topic. For those sentiment indexes where we pair an asset price, we display historical sentiment for the last 24 hours. If you need more details about the sentiment index history, you might click on the vertical meatballs on the right top of the Sentiment Cards. This brings you the last 7 days of sentiment index history and the recent events regarding to your topic with their polarity designation. If you are more interested in the actual events paired with price information for a certain asset, you might be interested in our Indexes page, or our Circles service to create your own theorem by using our data and algorithmic trading technology. Sentiment Channels display all major cryptocurrencies, assets and organizations grouped together with sentiment and buzz volume information. News and related countries and organizations often carry location information. This is visualized on a map with multiple view settings. Filtering, Sentiment, Volume and Replay features are available here. This section introduces you to our Crcl system, the way we enable you to create algorithmic trading strategies with drag n drop. This experimental feature can unify price action, logic, technical indicators and new data. The strategy can be backtested on tick by tick data. Crypto Theorem collects major crypto currency data and news that allows you to backtest your strategy on real historical data that gives you bias free result on your strategy. Our NLP technology and AI optimization makes if possible for you to get the best out of every trading idea that you have discovered with us. In this howto we give a short walk through of the major functions of the Crcl algorithmic trading strategy builder. In next howto articles we give more introduction on basic building blocks, strategy examples and advanced strategy building. The top bar contains project controls. These include Evaluate button to test your strategy. Project settings such as compilation mode and project selector. The project controls also include a status box in the middle or a progress bar if your evaluation is in progress alongside with a Timer. You may want to choose to compile your algorithm without evaluation in order to fine-tune its concept and to correct errors. Compile Only: Compiles algorithm without backtesting. Useful for debugging only. You can manage up to 5 project as a member. You can have up to 5 different strategies and respective datasets available for evaluation. Load project: Project automatically loads upon selection. CryptoTheorem website remembers your last project you have worked on. It will automatically select your last active project. After you have submitted your strategy for evaluation, the status box will display the current stage of the evaluation alonside with a progress bar. Compile only: Your algorithm gets verified and compiled to our proprietary format, ready to execution. Compile & Run: Your algorithm gets verified, compiled to our proprietary format. After your strategy is ready to backtest, your job will undergo a series of phases that you might follow above the progress bar. Queued: Your evaluation job is queued, ready to be picked up. Loading data frame: Collecting data for your requested evaluation including market data, price action tick data, order book history, technical analysis indicators, sentiment indicators. Expand data frame: Merging Price and News data, validating that your evaluation dataset is bias free. Your test dataset is being distributed among our high-performance clusters. Executing: Your algorithm is being backtested on bias-free data on a tick-by-tick basis. You can follow the progress on the progressbar until it completes. Done: Your backtest is ready, you might find the results on the page. You might always resume to your current project, your last evaluation results will be displayed. During evaluation, the evaluation button will be unavailable until the completion of the backtest. This section introduces Circles, the novel way how you can create algorithmic trading strategies without skills in computer programming. CryptoTheorem is the first system in the world which can integrate numeric market data with text based news in a way that it is becomes a tradeable, backtestable signal. CryptoTheorem represents trading strategies and algorithmic formulas in a visual way enabling drag and drop experimentation on quantitative price and indicator and news data. You might drag and drop circles (filled) and groups into your canvas. You will find System Symbol reference description if you click into a cirlce that is recognized as a system symbol operator like an arithmetic operator or a terminal, like a technical indicator. Symbol description contains the shorthand expression of the symbol you are examining. The card also contains its category, brief information about it. The page contains information about the point of observation, if there is computed value available after a backtest. You might find similar symbols recommended from the same category. Whenever you select a news event, a query or a technical indicator, CryptoTheorem shows you a right tab display of the relevant data. To help fine-tune your idea and discover trading opportunities we chart together news and query data, technical indicators, events against price data and other indexes. You might only see the dataset corresponding to your dataset selection. In this section we show controls below the table explaining the basics of creating and editing elements in your canvas. This section shows “Add” user interface. You can add a Node (filled) and a Group (not filled) with the buttons on the bottom. You might want to select Color for your circle by clicking on one of the colors on the scale. You might want to select a Parent for your item where it will be placed. If you do not specify, it will be dropped to the main canvas, from where you might Drag and Drop it to the place where it belongs. The Name of the node is interpreted by CryptoTheorem and will be used as an Operator or Terminal if you gave a full expression specification or shorthand notation. If it is not recognised as a system symbol, it will be used as a news event search term. You might want to Delete a Group or a Circle. To delete an item, you have to select it by clicking on it and click on the Delete Node. You might want to place Comments on your strategy or just simply would temporarily disable the Circle or Group. By placing a # to the beginning of a Circle of Group will make it as a comment, and the compiler will ignore it and its contents. You can make a commented node reappear in evaluation by removing the # from the beginning. Some operators require Order Notation to substitute the right values to the right places. You might specify and order of an item by adding a numeric prefix with semicolon. For operators which require only one parameter, you might not need to specify order. If order is not specified, default will be 1. If you are interested in finding a new profitable strategy, but you are looking for some extra ideas, you might use the “Start with a Few Words” wizard to create your first strategy draft. This interface is displayed by default if you are navigating to the Circles. To build a draft strategy, enter names of organizations, assets or events. The system will pick some similar items from the same category, and creates a sketch strategy for you that you might fine-tune later with Drag n Drop and/or AI optimization features. Submitting this form will reset your current project with new content, its current content will be lost. You might want to backtest your strategy with bias free data, which our real-time systems has recorded tick-by-tick. With our datasets you can backtest your strategies made with CryptoTheorem. Currently we support testing 30 days of data for a single asset on a single market venue or exchange. Select your dataset with the dropdown selector. You might select up to 30 days of data to backtest with a single instrument in a single market venue. After you selected your dataset, it will be automatically saved, and applied during evaluation and during showing the charts. You name it, we have it. CryptoTheorem uses building blocks called Operators and Terminals to build algorithmic trading strategies. CryptoTheorem’s algorithm builder understands hundreds of notations from the financial trading world and makes it possible for you to use them in your own theorem. If you are an advanced user, you might would like to use advanced Operators and Terminals in your strategy. To get more details about the Operators and Terminals that are available to your subscription, click on the category names, and list of items will appear. You might use full expression names or shorthand notations displayed with bold characters. $1, $2… notations displaying the order of parameters. Ie. If you want specify parameter $2, you start with “2:” prefix in your circle’s name. To run a full evaluation you have to have your strategy Compiled & Run. Before run, you might want to verify if your strategy is composed correctly. To ensure this select “Compile Only” and click “Evaluation”. Your strategy should be compiled shortly after you have clicked on the Evaluate button as shown in the next picture. Your strategy is complied to an expression form that is capable to be run. Depending on your subscription level, you might have simple expressions, GPU CUDA and our proprietary format to do AI optimization on your strategy. If this stage succeeds you will see your algorithms displayed with green color. In this case, you might proceed to Run your backtest by selecting “Compile & Run” and click on Evaluation. What if my strategy cannot compile? In case if you have discrepancies or other mistakes left in your strategy a red error message will appear, and the subjected group might be highlighted among the circles. Fix the error, and try to complile again. To start a backtest, you shall select “Compile & Run” and click the Evaluate button. Evaluation is in progress, you might wait for the evaluation to be completed. If you navigate away while your strategy is being evaluated the status will be saved and will be resumed as you are coming back to the page. After the evaluation has successfully happened to the dataset you have selected you will find the results of the backtest below your strategy. The results summary contains the following sections. The Evaluation Summary shows the total earnings (incl. fees) and numerous key metrics regarding to the behavior of your strategy. Metrics are provided in the free tier such as Transaction Win Ratio, Final Balance and Number of Transactions. You are also provided with transaction details of your strategy. Position history contains the type of your trade (Long/Short, Buy/Sell, etc.) depending on your settings, the start and final dates, the duration of the transaction, the net result (incl. fees), and prices. You also find a chart describing your strategy’s history on a price action draw. You can drill down to see explanation of the decisions and status of your strategy at a given point in time. Using this information as a feedback, you might want to refine your strategy. To achieve better results you might want to change your strategy. In order to do this, you might want to change Operators, Terminals, or try different schemes to match your trading style. You are offered with trading strategy templates that you might want to customize. You might also want to try different keywords and news events that might work better. CryptoTheorem offers a wide range of tools to improve discovery of trading opportunities. You might be egilible to beta test our AI optimizer that will find gradually better algorithmic trading solutions for your strategy idea. Use it to improve your performance, better trading, or monetize your AI strategy on our Strategy Marketplace. In this howto we show some strategy examples that has been made on CryptoTheorem. We offer paper trading to try out your trading ideas in real-time with our data and immediately see your returns as the price action develops. You might formalize your ideas in our Circles service where your can build an AI optimized trading algorithm based on your trading ideas you discover with us. Paper Trading is a useful method to test your trading strategy on real-time data, but with virtual money, so neither the losses or the gains will be realized. You might want to use your free virtual paper trading account for testing strategies and events yourself manually, or by connect your AI optimized algorithm. Our Paper Trading interface allows you to place a virtual Long or Short position on XXBTZEUR with your virtual account. If you have sufficient amount of funds in your Virtual Balance you can place a trade. Before placing a trade, make sure that you have selected the right amount, the position size via the slider. Your position will be opened and will be shown with Profit/Loss indication. Your balance will indicate your trade at the “In positions” section. If you would like to close your position, simply click on the Close Position button. At the moment Crypto Theorem only offers Paper Trading mode on a “virtual” account, no real money or crypto. You can Reset your virtual account at any time for free. We collect information about a lot of events in the news. CryptoTheorem Price Impact Chart allows you to browse these events based on their historical price impact to discover potential trading opportunities. You might want to chose events that are occur with large price swings or with large increase or decrease in extreme cases, or just have a significant skew towards either direction in an average. Positive and negative extreme impacts are highlighted with green and red colors respectively. You can subscribe to Events by clicking on [Add] button, ans unsubscribe from them by clicking the [Del] button. If an alert is triggered the website will display a highlighed alert icon shown in the following picture. Only the last couple of event alerts are displayed. You can reset alert notifications on website by clicking on the “Mark all as read” line. If you would like to receive E-mail and/or other forms of notification, you might want to setup your Alerts in the Settings page. Here you can also see a summary of which events you are subscribed to. This is CryptoTheorem’s main screen, displaying Bitcoin’s Sentiment index, price, and crypto market capitalization data. You have access to our search engine, our event annotations. You can find numerous cryptocurrenties, assets and organizations in our database that we track and have sentiment signal available with novel event detection capabilities. 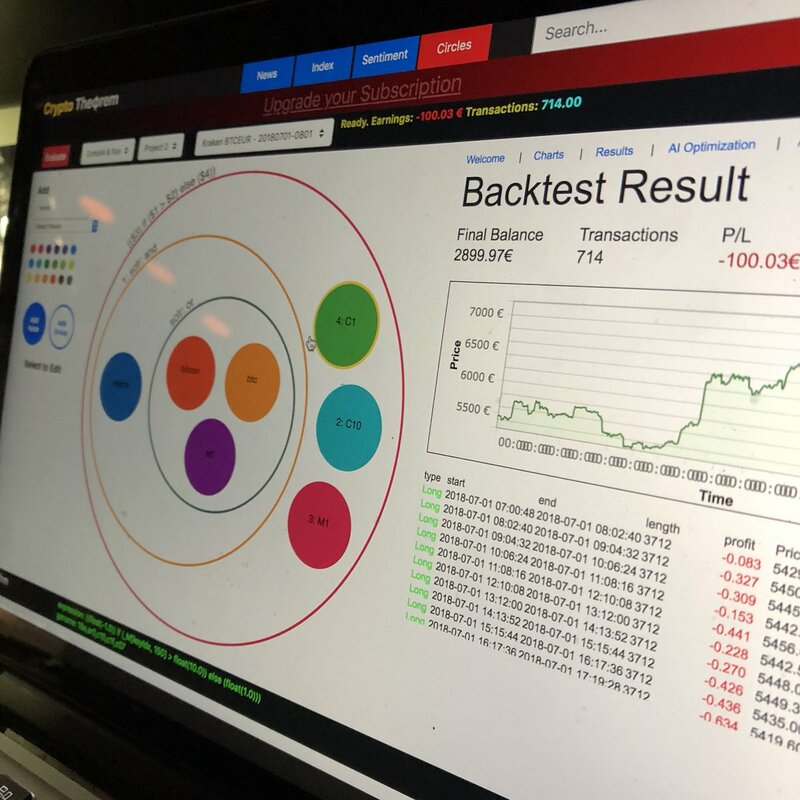 Data and charts that are provided on a provisionary basis might help our members tracking their trading performances, market sentiment data and create novel ways to trade on markets with our Circles trading system. Sentiment Index: Displaying the current and historical General Sentiment Index for the selected topics. Price index: Displaying the current and historical spot price for the selected asset. Market cap / custom index: Displaying the market capital or the selected indicator. Event Annotations is one of the greatest features of CryptoTheorem for traders. It shows price and global sentiment indexes aligned and highlights important events that might have sentiment implications, and which might effect the price in the short term as the information about the event dissipates in the market. You can see details of significant events incorporated to our Sentiment Index. These sentiment indexes are specifically measured for assets and organizations. Within this context significant events are marked with annotations. Annotations bring information about the general sentiment of that event. Many times we process events before significant price effect. This is a property of CryptoTheorem that we make these events algorithmically tradeable. You can do this with CryptoTheorem. You can see prices and sentiment indexes with event annotation. You can incorporate sentiment and events into your quantitative or algorithmic trading strategies. This is CryptoTheorem’s edge. We offer our members a window to peek into the general sentiment and major events that might affect the price. Our members might collect events into sets that can be validated on guarenteed bias-free data and create trading signals based on their ideas. Start AI Optimization with default settings. Best strategy will be presented according to fitness factors (ie, profitability). The AutoTrader runs your strategy on real-time data. You can execute your strategy online, creating a tradeable signal. This means we host your strategy in the cloud and feed it with real-time data. a) Receive alerts from your running signal. You are copy-trading at your discretion. b) Connect your Exchange Trading Account API keys to trade your signal. c) Publish your Signal and/or your Strategy to our Strategies marketplace. d) Proceeding with AI optimization to achieve better results based on your strategy. AutoTrader operates on high-frequency real-time data collected by CryptoTheorem. During the operation of AutoTrader we grant granular access to the internal state and immediate decisions of the strategy that you are executing. Autotrader is equipped to operate with any trading style (Buy/Hold, Limit, Long/Short, Leveraged) that you choose in your strategy. AutoTrader records every tick's state and trade order book, with instant evaluation. All transactions, that are initiated are logged. AutoTrader is equipped with mandatory pre-trade risk evaluation logic that is customizable by you. Autotrader is equipped with flash-crash protection, that suspends execution if price volatility thresholds exceeded. CryptoTheorem has extensive experience with exhange integrations and algorithmic trading, AutoTrader puts safety measures in case of Exchange and Data availability and integrity issues.